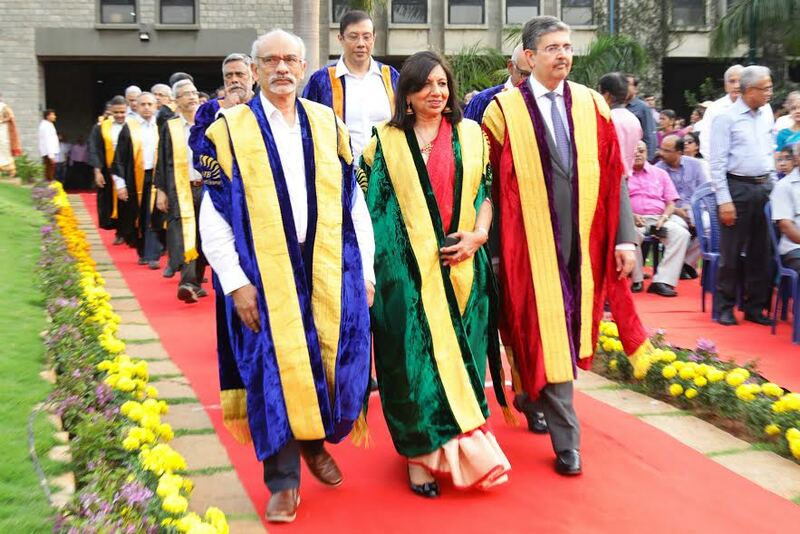 Bangalore: IIM Bangalore celebrated their 42nd Annual Convocation today (Monday, 20th March) at their campus. Mr. Uday Kotak, Executive Vice Chairman and Managing Director, Kotak Mahindra Bank delivered the convocation address. Dear graduating students, parents and family, faculty and staff, alumni, Chairperson and Board members, our distinguished chief guest for today, Mr. Uday Kotak, Enterprise partners, our friends from the Government, members of the media, and guests on and off the dais, I begin with the a deep sense of gratitude for making the Indian Institute of Management Bangalore what it is today, and for the opportunity to be part of you and serve you. I would like to recall the Directorial journey of this institution starting with Professors NS Ramaswamy, J Phillip, KRS Murthy, MR Rao, PG Apte, Pankaj Chandra and Sushil Vachani, each of whom have contributed to building this great Institution. My special thanks to Prof. R Srinivasan who served as the Director Incharge for nearly eleven months and enabled the transition in an elegant and comforting manner, a tall order especially when the horizon was not clear. I am indebted to you, Srini. It gives me great pleasure to welcome all of you to this 42nd Convocation of our institute. Congratulations are in order for Kiran, our Chairperson, and Chairperson and Managing Director of Biocon India Limited, who was appointed Knight of the National Order of the French Legion of Honour for her contribution in the fields of biosciences, research and innovation. We are proud of your many achievements, Kiran. Today, we have 598 students graduating: 20 from the Fellow Programme in Management, 18 from the Post Graduate Programme in Public Policy and Management, 75 from the Post Graduate Programme in Enterprise Management, 4 from its earlier avatar called the Post Graduate Programme in Software Enterprise Management, 70 from the Executive Post Graduate Programme in Management and 411 from the Post Graduate Programme in Management. While Kiran, in her address, will talk about IIMB’s milestones, I would like to share and celebrate with you a selection of the successes and achievements of our students and faculty, during the year. Our graduating Fellow Programme in Management student Kshitij Awasthi’s paper was judged one among the top 10 per cent of accepted papers at the annual meeting of the Academy of Management. Kshitij co-authored the paper with three of our faculty members – Prof. Sai Yayavaram, Prof. Trilochan Sastry and Prof. Rejie George Pallathitta. Two of our recent alumni of the FPM, Chinmay Tumbe and Anup Krishnamurthy, have received best theses awards. Chinmay received the EXIM Bank’s International Economics Research Award (IERA) 2015 for best thesis, which was announced in July 2016. Anup’s thesis was judged the best marketing thesis in India for 2016-17 by the International Marketing Trends Congress. He represented India in Madrid in January 2017. Among our current FPM students, Ankita Dash won the Best Paper Award for her paper titled ‘To Be or Not To Be in Global Value Chains – Empirical Evidence from Indian Automotive Sector’ at the IIT Kharagpur Management Doctoral Colloquium. She was mentored by Prof. Rupa Chanda, RBI Chair in Economics. R Sreedevi was the winner of the 2016 Production and Operations Management Society Emerging Economies Doctoral Student Finalist Award. A special word about our 20 graduating FPM students. This number is an all-time high, equalling an earlier record set last year. It gives me great pride to report that among the 20 of you, there are 17 peer review publications, including 5 in top tier journals. Out of the known 13 placements, 10 are joining academic institutions of which 6 are in other IIMs, a matter of great satisfaction for us. The 18 students of our one year Post Graduate Programme in Public Policy and Management are all geared up to take our national agenda of inclusive development forward. These three, along with Bhartendu Vimal, were the top among 165 participating teams from 36 B-schools including IIMs, IITs & ISB to win a prestigious national Business Plan competition. Our graduating students of the Post Graduate Programme in Enterprise Management, Suresh Ganeshan and Tousif Ahmed Inayath Syed, along with Prof. U. Dinesh Kumar, published a case titled ‘Predicting Earnings Manipulation by Indian Firms using Machine Learning Algorithms’ in Harvard Business Publishing. A group of our current students of the PGPEM, Avira Thomas, AC Beliappa, Suhas Narsimhan, Shoubhik Chakraborty, Sanjay Kurpad and Vishal Vora were runners-up in the 2016-17 Global Network Investment Competition, organized by the Global Network for Advanced Management, the GNAM. Our graduating students of the Post Graduate Programme, Deepesh Gupta, Kanika Bansal, Priyanka Bagai and Priya Jindal bagged the second place in the finals in the 2016 Global Business Challenge, a case competition conducted by the Queensland University of Technology, Australia. Mentored by Prof. Arnab Mukherji, they developed solutions to improve the effectiveness and cost of healthcare outcomes for isolated communities. Akshay Soni, Archit Jain, Dinkar Mohta and Swati Kanojia made it to the top 3 teams of the 2016 Morgan Stanley Sustainable Investing Challenge in Hong Kong in April. They were selected from 104 investment prospectuses targeting sustainability issues in 32 countries. Chaitanya Kansal was selected for the Economic Times Young Leaders Award 2016. Shreya Garg was the winner of the Woman Leader Award 2016, instituted by Citibank. Shikhar Rajendra Sethi, Madhav S Marda, Pulkit Aggarwal and Shifa Garg won the Asia Private Equity Investment Leveraged Buyout Case Challenge event, from among 30 global teams. This was organized by Singapore Management University, along with the New York School of Finance. Publishing in A category journals is a matter of great pride and visibility for the institution. There have been three such publications. Prof. Srivardhini Jha published the paper, ‘The Evolution of an ICT Platform-Enabled Ecosystem for Poverty Alleviation: The Case of eKutir’, in MIS Quarterly. Prof. Manaswini Bhalla published the paper, ‘Social Learning and Delay in a Dynamic Model of Price Competition’, in the Journal of Economic Theory. Prof. J Ramachandran’s paper, ‘Navigating Identity Duality in Multinational Subsidiaries: A Paradox Lens on Identity Claims at Hindustan Unilever 1959-2015’, has been accepted by the Journal of International Business Studies. Prof. B. Mahadevan has been invited to join the editorial board of the California Management Review. Prof. Pulak Ghosh was honoured with the Prof. PC Mahalanobis Medal for outstanding contribution to Econometrics by the Indian Econometric Society. And Prof. Ghosh has been named among the Top 5 Indian data scientists globally. Prof. Deepak Malghan won the Dr. V.K.R.V. Rao Award in Social Sciences. Dr. Malghan has won the award in the Human Geography and Ecology category. The main objective of the award is to encourage young social scientists to undertake original research. Two of our faculty have been awarded as distinguished alumnus/alumna from their own schools. Prof. Pulak Ghosh by the Oakland University, USA, in April 2016 and Prof. Vasanthi Srinivasan by XLRI in December 2016. Our faculty are not just world-class management academicians and researchers, but also excel in pursuing their interests and passions. Prof. B. Mahadevan has been conferred the Vishista Samskrita Sevavrati Samman 2016 Award by the Ministry of Human Resource Development. Prof. M S Sriram won the Karnataka Sahitya Academy Award for his collection of short stories and then for an essay. We are delighted by the success of our students and faculty. Dear graduating students, you continue to do us proud. You are committed, active, and energetic. Please put your all into serving the nation for its development agenda and to making the world a better place for humanity. As you move on to become alumni of this wonderful institution, I hope you will continue to cherish the eternal bond and remain connected with us, and do your best to make IIMB a runaway best. Go dream and pursue your passion with gusto!